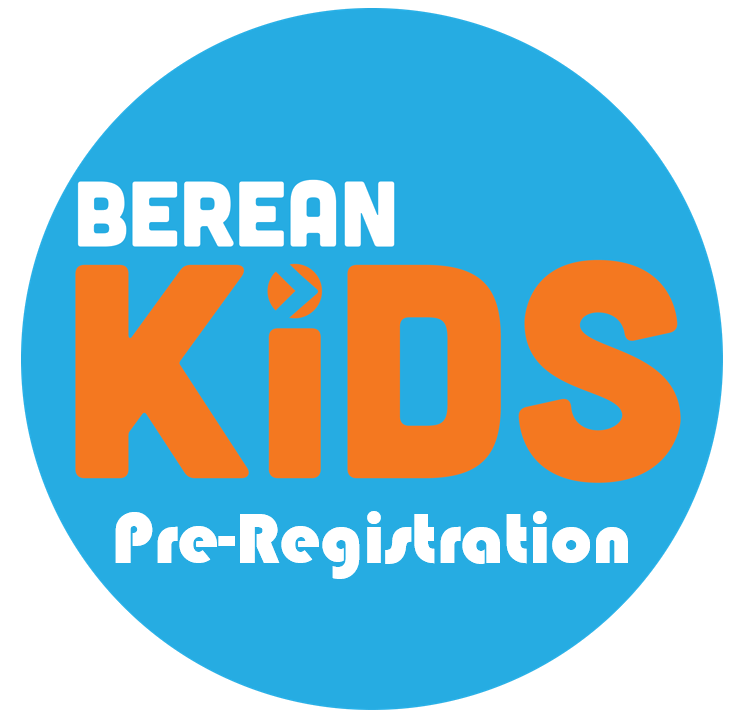 Berean Kids exists to engage, establish, equip, and enable kids and families to know and follow Jesus. At Berean we take safety very seriously with our little ones. For this reason we do electronic check-in for every event with childcare. 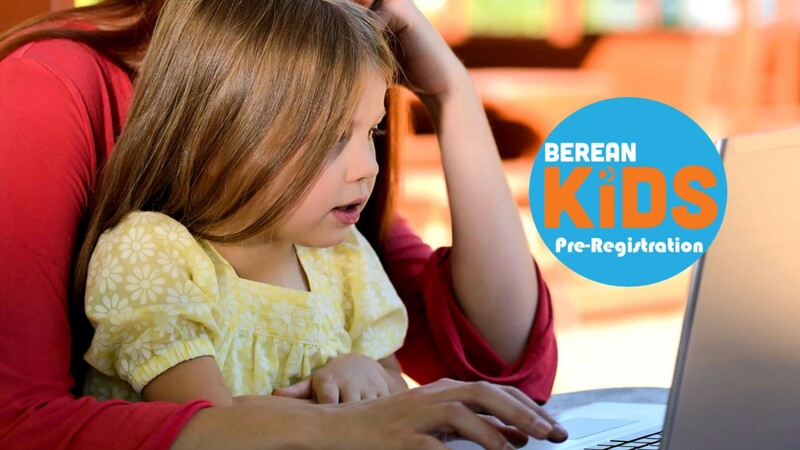 You can save time now by completing Pre-Registration (Click Here or the Button Above)! We offer ministry to children from birth to 5th grades both services on Sunday. Kid’s Church is designed to lead children to experience and respond to God’s presence through singing, prayer, small groups, and a “Bible Experience”. Sunday School uses “Explore the Bible” to teach the kids to study a passage in it’s context. We offer ministry to children (birth to 5th grade) from September through May, 6:45-8:15 p.m. In Preschool we use the Hands-On Bible Curriculum, which uses object lessons to make powerful connections between Scripture and everyday life by engaging all five of their senses. The evening includes: singing, games, Bible lessons and crafts. Elementary opens the evening with large group games in gym and crafts, and then gathers for an interactive large group lesson to introduce the nights theme. Afterwards the kids break into age based small groups for Bible study, application, and learning activities. Our goal is to create a safe, healthy and loving environment for your infant, baby and toddler so that they (and you) may enjoy your time with us. Please feel free to contact the people listed below if you have any needs or questions. Our volunteer staff loves preschoolers and we are excited to have the privilege of ministering to your children in the name of the Lord! We know that preschoolers are active and love to have fun, so we have developed a ministry that allows children with different learning styles to experience God’s love in ways they can understand. We pray your preschoolers will love Jesus and others more because of their time with us! Every child is made different and we seek to reach children according to their learning style. We hope the relationships your children form with peers and teachers encourage them to grow in godliness. We have lots of fun here as we follow Jesus and we want your children to have fun, too, as they follow us following the Lord! Our concern for the safety of all the children in our ministry flows from the love Christ has placed in our hearts for all people. Please feel free to contact Pastor Spencer with any concerns or questions. Creating a safe environment requires three steps: Screening, Supervision and Reporting. 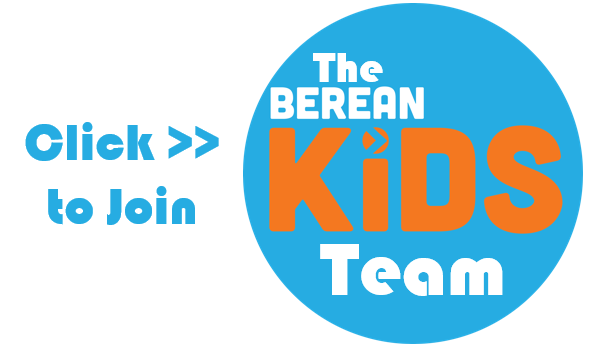 These steps are laid out in our Guidelines for Berean Baptist Church Children’s Ministry Volunteers. Copies are available upon request. Supervision: There are two adults in every room. An adult “Hall Guardian” patrols the children’s ministry area. There are windows in all the doors. Men are not allowed to change diapers or enter the bathrooms. Screening: All the volunteers in direct contact with children have had a background check, filled out applications and reference checks. They must attend Berean for 6 months before they can volunteer. Reporting: Volunteers are trained in how to report signs of abuse. MOPS stands for “Mothers of Preschoolers” – but don’t let that confuse you. MOPS is about meeting the needs of every mom of a child from conception through kindergarten by supporting and encouraging them. Being moms is what brings us together and allows us to build a community, and a MOPS group allows you to meet and build friendships with moms in your local community. The early years of being a mom are just as foundational to you as they are to your baby, and those years are filled with unique needs that other moms instinctively understand. Connect with our MOPS group on Facebook! Registration for MOPS is open every summer! Connect with us on Facebook to stay in the loop!